Grasslanz Technology will build on its core strength of providing innovative forage technologies while embracing new opportunities offered by plant biotechnology. While remaining the world’s premier source of grass endophytes and white clover and a world leader in the development of temperate forage cultivars, we will seek opportunities to identify technologies that can be developed in other plant species. Grasslanz Technology is a plant technology provider, our products are proprietary technologies primarily delivered through seed and our end users are farmers. We establish alliances with seed companies to commercialise our products. We work with an international network of investors and research organisations to develop innovative new products. Expand product delivery in species outside of traditional forage. 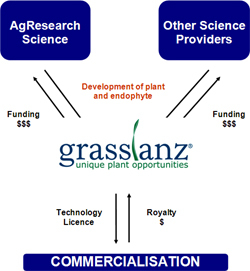 Grasslanz Technology business model is a six step process leading from the identification of a product concept to the products commercial launch by a seed company partner.